Private 25812 Gordon West, 5th Battalion, Oxfordshire and Buckinghamshire Light Infantry. 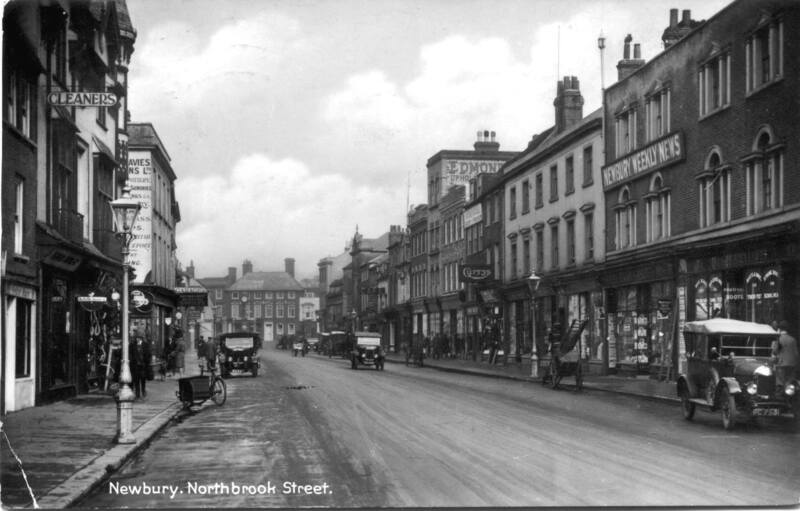 Northbrook Street, Newbury's high street. The Wests lived above No 34 (on the right with the large Newbury Weekly News sign). Oddly Samuel senior lived here while working as a grocer's clerk; his son, Samuel Ernest, worked as a stationer's assistant having taken over the tenancy - he was living above his employer's shop. Gordon was born in Newbury in 1885, the son of Samuel West and his wife Emily (née Clements). He was one of eight children, seven of whom lived to adulthood; the full brood consisting of Arthur (born 1872), Emily Daisy (1873), Walter Ryde (1875-1875), Samuel Ernest (1877), Frank (1879), Harry (1880), Gordon (1885) and John William (1892). Samuel was a grocer’s clerk and several of his sons followed him into white collar jobs; Arthur became a journalist; Samuel ran the stationers department at Blacket & Turner, Harry became an architect’s clerk, and Gordon became a corn merchant’s clerk. It is very likely that Arthur, Samuel and Frank (a printer’s machinist) all had the same employer – Blacket & Turner, who had a stationer’s shop in Northbrook Street which fronted the premises of their newspaper (the Newbury Weekly News) and printing works. When the 1911 census was taken the youngest brother, John, was listed as a student, aged 18 – unusually old for study at the time, especially considering that he was employed as a corn porter when World War II began. However, there is no listing for Frank in Newbury; sadly he can be found listed as F West – an inmate at the County Lunatic Asylum at Cholsey. The family attended the Primitive Methodist Chapel in Bartholomew Street but Gordon seems to have attended the Wesleyan Methodist School, which led to a children’s concert at Newbury Town Hall in 1899 that included an Indian club exhibition by Gordon West. (Reading Mercury 22 April 1899). Gordon and John may well have been helped in their employment by their sister Emily’s marriage in 1900 to Edwin Charles Midwinter, son and successor to local corn merchant, Henry Midwinter. In 1911 Gordon was also living away from Newbury, lodging with Edwin and Jane Baker in Witney, Oxfordshire. He settled in Witney and, in 1914, married Gladys E Barnett. Messrs Blacket and Turner had made application for Samuel Ernest West, 39, manager of the bookselling and stationery department. The military representative intimated that the Advisory Committee were prepared to recommend conditional extension to September 30th. The Tribunal agreed and granted extension to that date. At the time conscription was limited to men up to the age of 41, the closer one was to the upper age limit, the better one’s chances of avoiding military service. Although the tribunal only gave Samuel a 3-month delay in conscription there is every chance that further extensions allowed him to escape service. However, Gordon was younger and there would have been no escape if he was fit to serve, a corn merchant’s clerk would be seen as someone readily replaced by an older man or an ex-soldier, no longer fit for service. He served with his local infantry, the Oxfordshire and Buckinghamshire Light Infantry (the Ox & Bucks for short). This was a typical small county regiment with two regular battalions often referred to as the Oxfords (1st Battalion) and Bucks (2nd Battalion). Gordon served with the 5th Battalion, one of the new battalions created in 1914 and known as New Army, Kitchener or Service battalions. The full, official designation was the 5th (Service) Battalion – the ‘service’ referring to the men’s enlistment under unusual terms of service - for the duration of the war rather than the usual fixed 12 year term of service. The 5th Battalion went overseas in May 1915 and took part in a number of notable actions before Gordon would have joined up with them ‘somewhere in France’. Battalion war diaries rarely mention Privates by name; some will record the arrival of reinforcements by number – such as occurred with Gordon’s battalion on 16 April 1917: A draft of 205 OR [Other Ranks] joined Battalion. It is quite possible that Gordon was one of these 205 men. By that date the British were already involved in a massive joint offensive with the French (the Nivelle Offensive), the British element being known as the Battle of Arras. Having dismissed General Joffre who had been in command of the French forces since the start of the war the French appointed as his successor General Nivelle, hero of a successful battle towards the end of the Verdun campaign in 1916. The British also appointed a new commander, Sir Douglas Haig and a new Prime Minister, David Lloyd-George. Lloyd-George met Nivelle and was so taken by the fluent English speaker that he proposed that the British Expeditionary Force under Haig should be placed under Nivelle’s command. Haig was furious, but understood the chain of command and accepted the concept ‘for the duration of the offensive’. The Battle of Arras began in early April and had considerable initial success, notably the capture of Vimy Ridge by the Canadian Corps. However, the offensive soon ran out of steam and degenerated into relatively unsuccessful attacks on an enemy who was well prepared to meet them. 14th DIVISION attacked enemy positions in O21a & c – 41st Bde on right – 42nd Bde on left – 43rd Bde in reserve at 3.45am. The Battalion attacked at 3.45am on right of the Brigade – 9th R B [Rifle Brigade] on left & 8th K R R C [King’s Royal Rifle Corps] on right. Strength of the Battalion before attack 550 of all ranks. The attack was carried out with A-C Coys in first wave, ‘A’ being on the right - Battn bombers under 2/Lt C C HARPER in second wave – B & D Coys in 3rd wave – with ‘B’ on right. At zero the enemy opened a very heavy MG and rifle fire on our troops from St ROHART FACTORY (O15c 51bSW.2) HILLSIDE WORK (O21b) and an undiscovered trench in O21a. This trench was found to be wired and held in moderate strength and held up the attack temporarily. B&D Coys then reinforced the leading wave and the Battalion managed to force its way into this trench. Here – owing to very heavy casualties – it was obliged to remain. At 11am the Germans launched a very heavy counter-attack on our front driving bac the Division on our right – eventually thus driving the Bde back to original front line. At 8pm remnants of the Battalion went back to NIGER TRENCH. 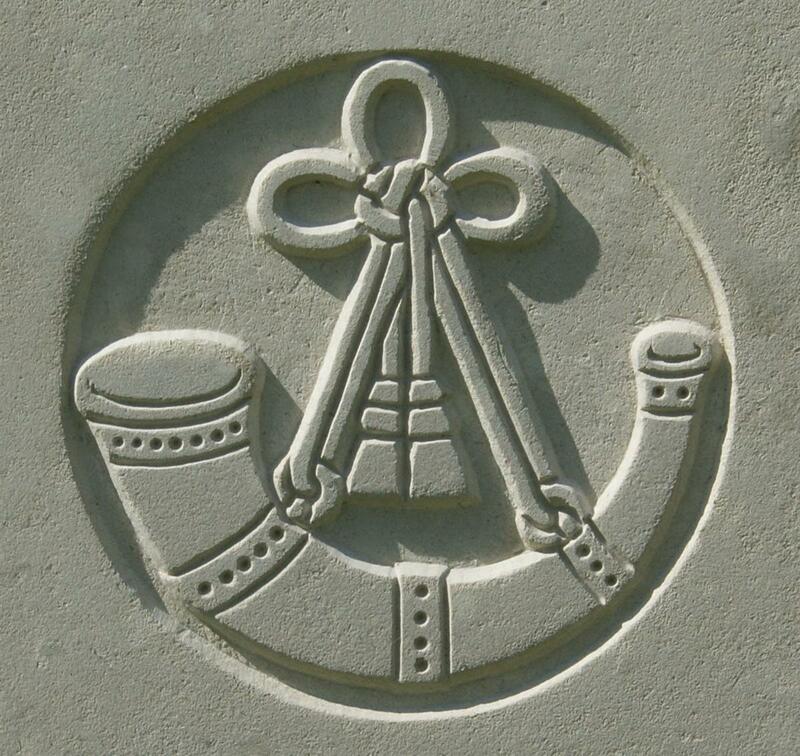 Casualties were as follows: KILLED Lt S ASHMAN, 2/Lt W C HAYNES & 17 OR Missing 2/lts C C HARPER, BULMER, RICHARDS & 112 OR. Wounded Capt GOODWYN, 2/Lt JACKSON, Lt HUTCHISON & 150 OR. Total 8 Off& 279 OR. A total of 285 casualties from a pre-battle strength of 550 – slightly over half of the battalion killed, wounded or missing. Before the war it was thought that casualties of 25% would break the morale of a unit, but throughout the war battalions regrouped and fought on after losses like this and worse. A message was received yesterday that Pte Gordon West was missing. Already fears had been excited by the absence of letters, which hitherto had come with accustomed regularity. Gordon is the fifth son of Mr and Mrs West, of Gloucester-road, and joined up at Witney, where he was living at the time, in the Oxford and Bucks Light Infantry. While there was always the hope that word would arrive that a missing man had turned up in a prisoner of war camp it was far more likely that a man missing during a day such as this would never be heard of again. Back in Newbury his family would have waited anxiously, often for as long as a year, with slowly diminishing hope until the dreaded news came from the War Office that their son, brother, husband had been presumed to have died the day he disappeared. Gordon’s remains were never identified; he may lie under one of the many graves marked with no name and the epitaph Known unto God. 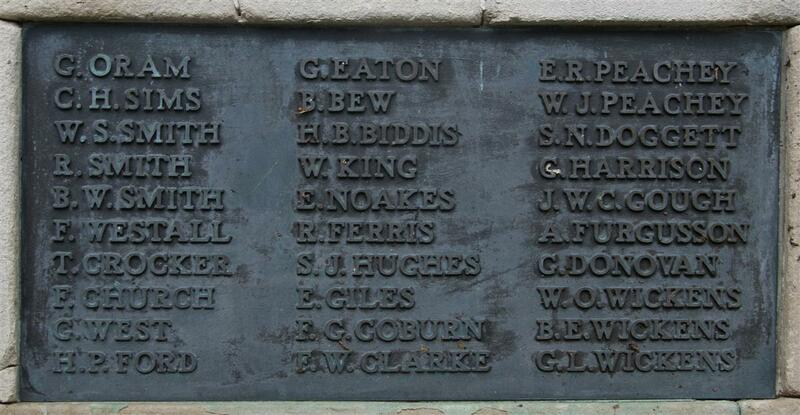 His name is remembered on the Arras Memorial to the missing of this and other battles around the town. His was also among the names on the stained glass window commemorating the fallen members of the Newbury Primitive Methodist Church in Bartholomew Street.